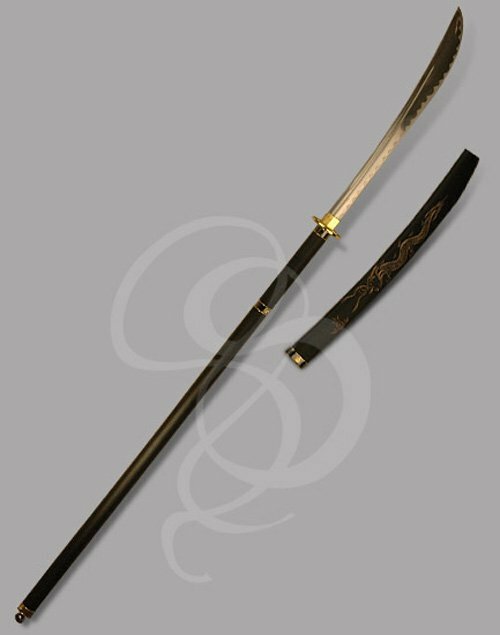 The naginata is one of the more lethal pole arms of the Japanese. With a devastating 60-inch reach and a arc of death that can aerate several foes at once, the naginata was a pole arm to be feared. This is a beautiful recreation of the style of pole arm embodied by the naginata. It is 60 inches long with more than 20 inches of stainless steel blade. The blade features a gorgeous sawtooth temper line along the edge and a shallow fuller across the top. The blackened metal handle unscrews in the center for easy storage, but screws together tightly for secure swinging. An ornate brass tsuba protects the hand, and a matching medallion graces the center of the staff. As a beautiful addition, a hand carved wooden sheath comes with the pole arm. The sheath has a brass throat for a tight, durable fit on the stainless steel blade. Although this pole arm is not hand crafted, it is a gorgeous pole arm with attention to details. Not recommended for serious sparring, this item can nevertheless be swung satisfyingly (in a safe area, away from all other living creatures that might be hit by the sharp blade). Staff Blackened Steel (unscrews for easy storage). This sword is sold sharpened, so please check the laws in your state concerning the sale and delivery of sharpened weapons. By purchasing this weapon, you agree that it is legal to ship this weapon to your state. You must be 18 years of age or older to purchase this scimitar. And you certify that you really love swords and other weapons of honor.